The Istrian Peninsula at the top of the Adriatic, (just below Trieste), was Italian until 1945 when it became part of Croatia. People still speak Italian here, and it's even taught in schools. In fact, Istria is sometimes known as 'Croatia's Tuscany'. It houses a treasure trove of antiquities, including a vast Roman amphitheatre in Pula, and exquisite Baroque and Byzantine basilicas in Rovinj and UNESCO Porec. Inland, tiny frescoed country churches and stone beehive huts called kazuna are sprinkled over oak forested countryside. Red-roofed villages with peeling shutters soak up the sun, producing olive oil and wines among the finest in the Mediterranean. This holiday explores Istria's west coast. The first three nights are spent on Fazana's pretty harbour, where fresh fish are landed on the dock opposite the hotel terrace. From here you can explore Pula, loop inland to Vodnjan (Istria's ancient capital), and visit the amazing Brijuni National Park offshore. You'll then spend two nights in Rovinj, a coastal hilltop town of marbled, boutique-lined alleys, before the last two nights in Porec, where yachts line a waterfront of arty bars and restaurants. This trip is perfect for occasional cyclists who love laid back harbour-front dining, hotels of real charm, and varied cycling trails. Along the way, swimming in crystal clear seas every day is taken for granted, and electrifying sunsets are the hallmark of every evening. 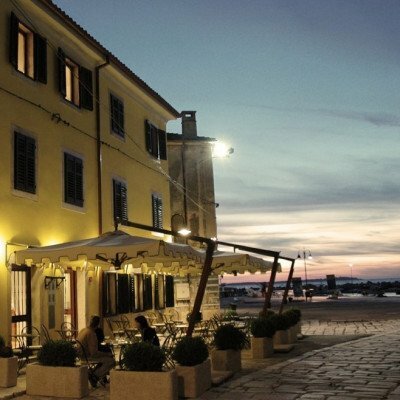 In Fazana, Rovinj and Porec with such an enticing choice of excellent-value restaurants (many of them on the waterfront), we have left the choice to you. On arrival you can relax on the hotel's terrace, go for a swim nearby or explore the village before your bike briefing. Pula is an easy warm-up ride. There is a network of marbled alleys to explore, many packed with Roman remains including a beautifully preserved amphitheatre from 27BC. Spend the day here or head back to take the boat to the Brijuni National Park - Roman villas, Byzantine villages, herds of deer and pine-fringed bays make for an amazing visit! Pedal inland through lemon, pine and olive trees to Istria's ancient capital of Vodnjan, a sleepy village full of Gothic, Baroque and Renaissance architecture. Pick up some picnic supplies at the bakery, then head north for lunch amid kazuna (stone beehive-style huts), near the C8 church of Sta Foska. Return along the coast, passing remains of Roman baths on the shore. Back in Fazana, take a sunset stroll along the harbour. Head north through walnuts, plums, almonds, figs and vines. A steady, gentle ascent brings you to the small town of Bale, known as Castrum Vallis by the Romans who built a castle here to protect their salt trade. It's then downhill to the sea and a winding coastal path under umbrella pines, bayhopping for 8km by crystal seas. Rovinj rivals Venice (just a day trip over the bay) for charm, where marbled alleyways are soft with candlelight and lively dining tables. Lose yourself in art galleries and boutiques, find a sunny swimming cove, or even pop over to Venice for the day. Alternatively, take a lazy northern loop passing ruined churches, olive groves and oxblood soils tilled by rusty tractors. On your return, enjoy a swim from the boat piers, then relax with a sundowner on the shore. After sunset some bars put cushions on rocks and underwater lights shimmer as fishing boats return for the night. Take sun-dappled back roads inland to the head of the Lim Fjord, an impressive wooded valley and today's big challenge! Freewheel down to the base and ascend a 2km hill to the panoramic viewpoint on the other side. After lunch in one of the many grill restaurants en route, head back towards the sea to meet the coast 10km south of Porec. The 300AD UNESCO heritage Basilica of Euphrasius with golden frescoes and intricate mosaics is at the heart of Porec, and you cycle past it along the shore as you go north. Seaside tracks pass a ruined Roman amphora factory, and follow clear bays and headlands for 10km. Loop back inland to visit a giant limestone cave - Jama Baredine - then sip some zingy Roxanich wines as you pass by their vineyard, before heading back for a swim in the pool. Please note that cycling helmets are compulsory in Croatia for all customers under 16yrs. As we are unable to provide these, we strongly recommend that you bring your own. During your holiday you stay at the following hotels. 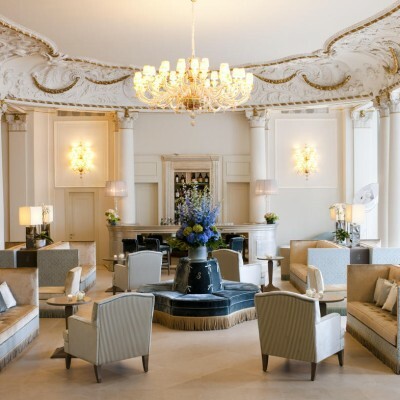 If you'd like to extend your time at any of these or, if you'd like to enhance your stay with an upgraded room, just let us know at the time of booking. If you'd like to keep your bikes with you for any extra nights we can arrange this for you for just £23 per adult per day. Villetta Phasiana is in the heart of Fazana, right on the harbour front square. It is a three-storey property recently renovated, with smart bedrooms and modern bathrooms on the top two floors, with shuttered windows looking out onto the streets or the square below. Breakfast can be taken on the attractive terrace on the square. The bar is in the shape of a fishing boat, and attractive artwork is on the walls throughout. Three superior rooms (larger with a seating area) and a sauna and Jacuzzi can be found in the building next door. Please note that twin rooms are two mattresses in the same bed frame. Superior rooms have space for an extra fold out bed if required. Superior rooms are larger with harbour views. Villa Tuttorotto (meaning 'everything broken' in Italian, which it was before renovation), is also in the heart of Rovinj, one street back from the waterfront. This is a little 7 bedroom townhouse, squirreled away down a back alley, with a delightfully personal atmosphere. Bedrooms are compact but beautifully presented, and a common lounge full of bric a brac and white sofas is a relaxing place to meet other guests. Please note that twin rooms here are 2 mattresses made up as twin beds in the same frame. The superior room is larger. Just a short stroll from the nearest beach, in a quiet area, the Hotel Flores is located near the waterfront and marina in Porec, right at the very tip of the Porec peninsula. The hotel has 39 bedrooms and an extensive wellness area with beauty centre, indoor swimming pool, whirlpool, sauna, Turkish bath and fitness centre. The hotel's restaurant serves, meat, seafood as well as local and international specialities, or there are many other restaurants to choose from along the waterfront. 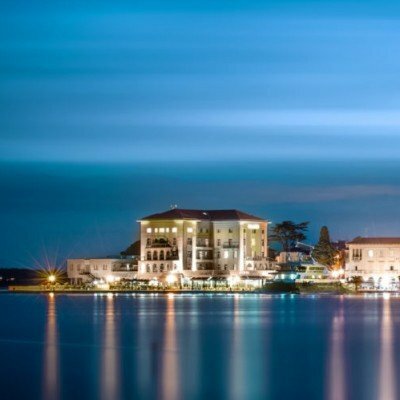 Located in a prime position on the waterfront and marina in Porec, the 50 room Hotel Palazzo is a celebration of marble floors, chandeliers and has a great spa and terrace with a swimming pool. Bedrooms are very spacious with ultra modern bathrooms and every room has a view of either the town, harbour or sea. Breakfast can be taken on the seaside terrace, and there are lots of restaurants lining the waterfront just steps from the door. Please note that twin rooms here are two mattresses within the same bed frame - an extra temporary bed can be provided if you require separate beds. 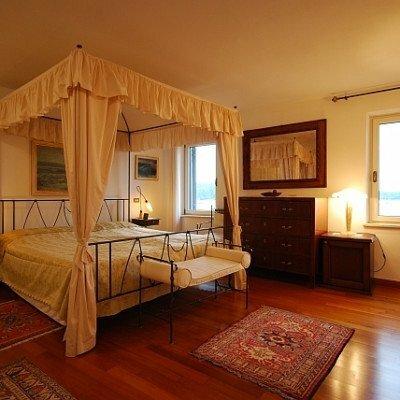 The suites are very large with extensive sea views and a separate lounge. Transfers included from Pula airport at 12:25, and back to Pula airport at 10:40. A great cycling holiday .. would recommend either end of the season as Croatia looks as if it will get full in peak time with RV's and people. So best to go when quieter and cooler for cycling. Bruna is great ..take her advice on road section to Porec as road is steep , very narrow and with a lot of vehicles is dangerous. Please check the distances as given in the notes, for example in one place it says continue on road for 2Km but it is much nearer 4. An excellent way to see a lovely part of Croatia. Fantastic holiday. Great locations, especially Rovinj, which is fabulous, we really want to return there. Cycling was the right level of distance and slopes. We are already booking next years holiday with Headwater as we loved it so much.. Only negative was the very wordy, and sometimes out of date route notes. A little map would help and they should be checked more often. Would definitely recommend this trip. A good combination of sun, sight-seeing and cycling. The cycling was rarely strenuous and was a good way to see this very attractive part of Croatia. Its great to have everything done for you, and someone on hand to deal with problems or issues that arise. Cycling planned routes enables you to see far more of the country and its interiors. if you like the idea of activity during the day and chilling during the evenings and nights then this is the type of holiday for you. Thoroughly enjoyed cycling in Croatia - a great way to experience this lovely part of the country. The hotels were all gems and the itinerary allowed us to see and do everything we wanted to. Headwater always gets it just right! The cycle routes aren't as well-established as some we have followed in France and Italy but it appeared that they are being improved, for instance a new stretch of coastal path designed for both pedestrians and cyclists had just been completed. We had a wonderful time , bar the lack of working air-conditioning in 1 hotel. We met friendly helpful people on our trip, and enjoyed the wonderful and rugged scenery. The hotels in Fazana and Rovinj were lovely, as were the staff, and the hotel in Pores was good. All were very well placed within the towns. We were disappointed with the bikes that were presented to us. Luckily we had taken our own saddles and pedals otherwise the bikes would have been more uncomfortable. I found the gravel tracks to be very difficult to ride on and this spoilt it for me. My husband was not so bothered. The country lanes were lovely to cycle along. We were both surprised that we were advised by Bruna to have a transfer along a section of the road that she considered too dangerous for us to ride on. The road was too narrow and the gradient was too steep. This was not reflected in the travel guidance which led us to believe that this a gentle 2K uphill ride. Basically, this is not a ride for occasional cyclists. We cannot praise Bruna enough, she was fantastic and really looked after us. Lovely cycling along quiet lanes, hilltop villages, olive groves. Coastal Croatia Cycling was a great holiday, in an interesting and scenic coastal area and we followed it with the Venetian Villas and Vineyards Cycling as it is easy to get a ferry from Porec to Venice (prebooked on line). Bruna was an excellent rep, providing a thorough and useful briefing at the start and a debrief meeting at the end and was very contactable if needed. We took up her offer of a lift across a busy section of road in the last week of the Croatian school holidays and a detour to view the Lim Fjord on Day 6. The stone/Kazuni houses were well worth visiting on Day 3. Note that if you really want to visit the Jama cave on Day 7 in a busy holiday time you may need to book ahead or wait 2 hours for a tour. Swimming is possible on many of the days, however the beaches are stony/rocky so beach shoes are required and are available to buy in Fazana near the hotel for only about 10 Euro. This was our 3rd Headwater cycling trip and we thoroughly enjoyed it. Enjoyable cycle rides, in beautiful coast and countryside, well within the capability of the averagely fit (with the exception of the section around the fjord). Bikes well maintained - rugged but a bit heavy. Bruna was an excellent rep and provided a transfer to avoid having to cycle the fjord road. Good standard of hotel accomodation. Would recommended this holiday. The cycling holiday to Northern Croatia was a joy. Knowing that your bags were in safe hands and that they would be delivered to the next destination was fantastic. It meant you were able to cycle at your own pace, take in all the sights and scenery, take a dip in the water at your choosing and as many times as you like and stop at a restaurant for lunch along the ways was just the best. A really wonderful holiday. Croatia lived up to all expectations and we would be more than happy to return. Everything about the holiday was first class but it was Bruna that stood out for us - she spent a lot of time with us and came to pick us up to avoid a very dangerous road. Lovely area, easy cycling, good food and lovely hotels! 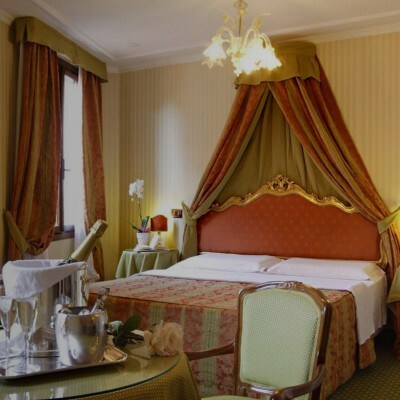 Hotel Tuttorotto deserves a particular mention. It is a very special place, the staff extremely welcoming and breakfast on the terrace overlooking the sea was fantastic. Croatia is a beautiful, welcoming and friendly country. We were told by locals that we were mad attempting to cycle in high season because it is too hot and the roads are too busy to be safe. Yes it was hot, but there was a good breeze and much of the cycling is on quiet back roads or off-road. We enjoyed exploring on our bikes and felt safe. There is one stretch of dangerous road on the way to Porec that our rep told us she would not allow us to cycle and would drive to pick us up and take us to the other side. She does this for everyone, this could do with being updated in the notes. Fazana and the first hotel were superb, Rovinj was very different but again beautiful and the hotel was quirky and fabulous. The trouble was that the further we went the more touristy and busy it became. Porec was fine but too many tourists and a very ordinary hotel with mass produced breakfast was a bit of an anticlimax at the end of the route. It may be worth Headwater looking into running this holiday in reverse so that it ends on a high. This having been said, it was a fabulous holiday, the crystal clear turquoise sea round every turn was beautiful to swim in, we swam in the sea every day, it was a fitting reward at the end of each cycle ride. Cycling the Istrian coast was a prefect holiday. We were able to enjoy the right mix of cycling, swimming and relaxing at the beach. The side trips to small towns were well worth it. The food and wine is excellent. A highly recommended holiday. one of the best cycling holidays we have been on. Great cycling and relaxing swimming in warm seas. Lovely locations, great hotels with well thought-out cycling routes that took us to parts of the beautiful Istrian peninsula that other visitors would never see. Headwater Holidays are always an interesting and memorable holiday. The variety of accomodation combined with cycling or walking abroad is a winning formula whether you travel as a couple or with fitness minded friends. We have tried over 10 destinations now over the years including the canoeing down the dorgogne and every combination has been wonderful. The guided walking gives you a chance to see and learn about areas of europe that are off the beaten track and you feel like you are experiencing the real country. Excellent way to experience the beauty and friendliness of Croatia and in particular the Istrian coast. Bikes excellent and fit for the sometimes stoney cycle paths. Not as daunting as we had envisioned bearing in mind we are both over 70. Rep excellent and very helpful. All accommodation is well chosen and perfectly located. A cycling holiday with an emphasis on the holiday aspect. Great Fun. Lovely area and great cycling. As occasional cyclists we found the cycling very manageable on a mixture of Tarmac and gravel tracked routes. The coastal scenery was stunning and the three different locations provided a good variety of places/shops/ancient sites to explore.The standard and location of the hotels was very good enabling easy foot access to a reasonable range of restaurants for which Tripadvisor proved useful. Everyone was friendly and our holiday aided by good weather was a great success. Everything went very smoothly, no hitches, excellent hotels and some good cycling. Croatia is a lovely country but the cycling routes were not good. A lot of the routes were on busy main roads up-hill with lots of heavy traffic. The cycle paths were mainly shingle and quite dangerous and very dusty. One cycle path (shingle) had a quarry in the middle of it and heavy quarry lorries were using the cycle paths - nowhere to escape - and dust everywhere. The hotels were good. Some of the cycling was through popular beach side areas and therefore one had to beware of pedestrians/children, etc. All in all, although there were some lovely villages en route, cycling on the roads with no views was not worth it. The countryside was pretty and the places we stayed in had narrow, windy roads barely wide enough for a car which were intriguing to explore. Snorklling was fun and there were fish to see from waist height just standing in the water. The cycling was not overly challenging but the heat had to be managed with plenty of water and early starts. Cycling the Istrian coast was such a wonderful holiday for myself and my husband. The sea was gorgeous, some of the routes were a bit bumpy and confusing but each location was so beautiful it was incredible. Food was great in the first two hotels and such stunning locations. We would definitely recommend to a friend and think about going on another holiday with headwater. Croatia and the Istrian Coastline are a gem and offer a variety of historic and scenic opportunities. Headwater never fails to please. We have holidayed with them on three occasions now, love their routes, their choice of hotels and attention to every detail. This was a great holiday, well organised, excellent communication, excellent rep who was very helpful, great route notes, good quality bikes and gives you an opportunity to visit some fantastic places on the Istrian coast in Croatia and see some lovely sights. My only concern is that some of the routes, in my opinion, are quite dangerous, especially the unsurfaced roads and gravel tracks. If you have no experience, or little experience of cycling, this holiday I would suggest is not for you. Even as a regular cyclist I found some routes difficult and challenging. If you struggle with heat, I would suggest not choosing a holiday in July/August, but go for May or early June. You could be spending 4/5 hours out in the heat on some days. However, if you love cycling, then this holiday is perfect and first class, a great company to go with as everything was organised as advertised and I would throughly recommend it. An enjoyable holiday. Well organised, good bikes, very comfortable accommodation and breakfasts. Croatian coast attractive, and not too busy in September when we went and Croatian staff in hotels and local restaurants all friendly and helpful. Rides well planned, and maps and directions good. I had an unfortunate fall skidding on a wet road, and couldn't ride one day, but the support from local bike hire was excellent, and myself and bike both made it to the end of the holiday. Would recommend as good medium level cycling break. Maintained the high standard we have come to expect from Headwater. ...the 3 hotels were very different, but, were all in good locations with quality offerings. the people and staff of Croatia are very welcoming and have no airs and graces about themselves. the bikes are well maintained and sturdy, and, need to be for some of the unsurfaced paths. Rovinj was our favourite place, but, all towns / hotels that we visited were pretty and welcoming. Great hotel locations, very friendly with good service and excellent food and drink especially the abundant and very good value seafood. Lovely relaxed cycles with plenty of 'things' to see along the way. The only difficulty was the route notes which had had the maps removed and left only descriptions and a very large region map. The guides had removed the maps because they were 'confusing' - I suspect that reflects a difference between visual and aural people - we would have been MUCH more comfortable with a MAP - particularly since some of the descriptions in the guide were a little wrong. A very good holiday. Some of the roads were a bit dangerous narrow fast and bendy like the road round the fjord. Some of the off road was too rough with big limestone chippings. Your reps were working on different maps to us. The whole holiday exceeded our expectations. Thank you. We will travel with you again. Thank you for your lovely feedback, we were pleased to see you enjoyed your holiday in Croatia. We look forward to welcoming you on another of our holidays in the future. Excellent holiday overall, enhanced by a good mix of 4 couples in our group. BUT the performance of your reps was very poor in terms of availability and understanding of our needs. All 5 of us had an excellent hoiliday ,Thank you. One possible improvement- the last day's 'Directions' (Porec to Novigrad) were much simpler to follow than the other days' , because they used the local cycle route signs as reference points ; but there had been cycle route signs all along the way on previous days - they just were not mentioned. Great location for biking, loads of marked routes, do go to the local tourist office and get the leaflet which gives all local cycle routes for that area, and use these whenever you can. Great hotels, with friendly staff, the locations vary but all interesting, our input to Headwater would be that the hotels need to be very good to make these holidays value for money. Good bikes which were well up to the local cycle routes! Do swim whenever you can as the sea was fabulous, and warm! This was our sixth Headwater Cycling Holiday and every bit as good as the others. Croatia is lovely place for cycling, not too strenuous.. The hotels were all excellent and well situated. Eating out was easy and good value. The towns and villages were all interesting places especially The Roman ruins in Pula and the round stone shepherds shelters were a highlight. We had time for two enjoyable boat trips. To get the most enjoyment out of this holiday one needs to build up cycling strength and stamina as there were some long rides with hills which needed a lot of energy, particularly for my age group (65+). Fortunately I had been doing this for 4 months so it was fine. This was not a problem for my 25 year old daughter. The cycle paths were a bit challenging as the surface was sharp loose stones and it was necessary to get off the bikes and walk on many occasions. Croatia is beautiful and the weather was perfect - swimming was possible every day. This is a great way to experience a country up close and get to places most tourists cannot. We have taken several holidays with Headwater mainly in France and have always enjoyed them,but this one in Croatia comes top.Lovely countryside, many wild flowers to admire, super accommodation and very friendly people. We normally travel with our own bikes and a map, so this holiday was a wonderful luxury. Given the number of small back roads, I think we would have struggled to find such a good route on our own. The hotels were all very comfortable, friendly and welcoming and the countryside was beautiful. We went in September and the temperature was ideal both for cycling and for relaxing on the beach. On the evidence of this holiday we are keen to return and see some more of Croatia. Great way to enjoy a weeks holiday with like minded people.Makes keeping fit enjoyable and easy. This was the best cycling holiday we have been on with Headwater. Excellent cycling, if tough in places, great hotels and beautiful scenery. The water was crystal clear and it is well worth cycling beyond Pula to some excellent secluded beaches. The 4am start at Gatwick was the only downpoint of the holiday - please Headwater put on some more sensible flight times in future. Great adventure, beautiful country new to us, superb mix of historic hilltop towns, world-class Roman heritage, lovely coast with tempting swimming coves, Italian food with a Viennese twist, red-earth olive groves and vineyards. Be prepared for some VERY rough tracks, thrills and spills, or get off and walk for extended sections. HOT, long days cycling but all very much worth it on arrival at characterful destinations and comfortable lodgings. Two excellent hotels, Villetta Phasiana and Villa Tuttorotto, the second with a harbour view that was beyond fantastic. The cycling was energetic at times with a couple of busy roads and the occasional error in the 'talk-round' leading to some extended routes and some interesting conversations with locals to get us back on track - but overall was fine. Good bikes by the way. Croatia surpassed expectations. We would have happily have stayed longer in all the places we visited. There is so much to see and do as well as the cycling.The first 2 hotels especially were just a bit different and in all 3 resorts there was an abundance of restaurants to suit all tastes. The Croatian people were warm and welcoming and we would definitely go back. Be warned that August is perhaps a bit too hot for the cycles with the hills ! The holiday was described as soft and leisurely however, it was much tougher than that description. There were more steep climbs and a lot of gravel tracks which was difficult to cycle on. Each day did not get within the 3-4 hours detailed in your description of leisurely . Other than the cycle rides, the hotels, travel arrangements and representative were excellent. the consistently high quality of accommodation and locations.Perhaps even more so this year(esp. with no evening meals provided ) we are however very much aware that we are paying slightly more than we should be. and obviously this is likely to affect future decision -making. Excellent location although on occasion the cycling was more challenging than expected and we spent a lot of the cycling on busy roads rather than cycle paths. Tuesdays from 7th May 2019 to 24th Sep 2019, for 7 nights. All dates are subject to availability, please contact us to check. Due to the tailor-made nature of our holidays, we need a little more information in order for us to check availability for Coastal Croatia - Pula to Porec Cycling. Simply complete the form below and a member of our sales team will contact you (when it's most convenient for you) to provide availability information, travel options and an accurate price. Of course there's no obligation, but if you do wish to proceed with a booking they will be on-hand to assist you throughout the process.